Fully loaded, but firing blanks. Ben Wheatley's Free Fire is a period piece in more ways than one. It's set in Boston in the 1970s, an era of face-consuming sideburns and leisure suits with mile-wide collars, but it plays like one of those forgettable Quentin Tarantino rip-offs that we saw a lot of in the wake of Pulp Fiction's surprise success. 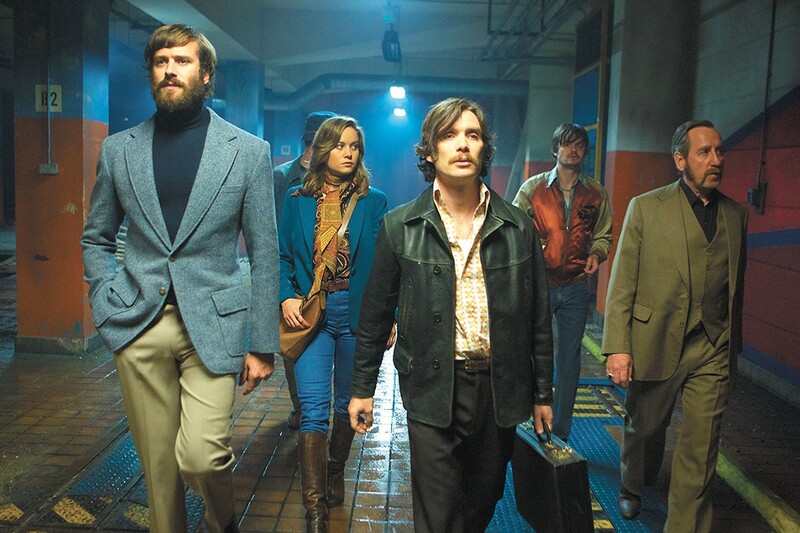 Free Fire is trying so desperately to ape that landmark 1994 film's ironic detachment, with its laissez-faire attitude toward ultra-violence and its hipper-than-thou dialogue, that you can practically see the flop sweat. Perhaps Reservoir Dogs is a better point of comparison: After all, here's a movie set entirely in and around an abandoned warehouse, with a large cast of wisecracking criminals engaged in an increasingly elaborate Mexican standoff. It even employs an incongruously sunny pop tune (in this case, John Denver's "Annie's Song") during its most gruesome death. It grows oh-so-tiresome almost immediately. But the film's setup is legitimately intriguing, with a member of the IRA (Cillian Murphy) meeting a quirky South African arms dealer (Sharlto Copley) to purchase a cache of automatic weapons. Both guys are accompanied by their respective goons and a couple of American liaisons (Brie Larson and Armie Hammer), and they all anticipate a quick-and-dirty operation. Predictably, the deal goes south fast, and so does the movie. Before we know it, everyone's crouched behind rubble and shooting indiscriminately at one another, and the movie goes about trying to set a world record for most ricochet sound effects in a single film. And just to complicate matters, some snipers appear on the perimeter of the building, but who do they work for? Should we care? Free Fire is billed as a comedy, but it really only has one (bad) joke: The characters are remarkably casual about being shot over and over again. I guess it's supposed to be funny when Hammer stops amidst the maelstrom to fix his hair in a mirror, or when Larson and Murphy make dinner plans as they're lying on the ground bleeding out. That the violence is itself so gritty only makes the Looney Tunes-style antics all the more unamusing. Because it doesn't really matter who lives or dies — the characters are merely bullet receptacles — the film is really all about style, and yet Wheatley doesn't have any interesting tricks up his sleeve. He also doesn't take advantage of the warehouse space, something he should have learned from Reservoir Dogs. He mainly photographs his actors in medium shots and close-ups, so we're never entirely sure where they are in relation to one another and who's shooting at who. Maybe that's the point. Free Fire is not showing in any theaters in the area.